Home Fashion Sewing	International Fabrics – Ever Wonder Where the Best of Each Textile Originates? International Fabrics – Ever Wonder Where the Best of Each Textile Originates? Ever wonder where in the world some of the best choice denim, knits, and jersey fabrics come from? Thinking about a light silk or linen for the spring or summer and wonder where to get the best quality? We have it all here at Mood Fabrics. Mood purchases the best quality fabrics from the top mills across the world. Below, I will give you more insight as to where the best quality fabrics originate. Take a look at the international fabrics Mood has to offer you throughout many seasons. China is known for its production of the best silk around the world. We also have China Silk or Habotai here at Mood. Habotai or China Silk are interchangeable terms for the lightweight and fine, shimmery and semi-sheer, plainly woven silk incredibly sought after all over the world. What makes China’s silk the best? It starts with a centuries old secret tradition of cultivating the perfect silk worms to produce the finest and longest filaments of silk while spinning their cocoons. Then it continues with caring for the cocoons in order to successfully unravel the fiber, turning it into yarn, and weaving the luxurious fabrics we all love to wear in the spring. Check out our fabric section on silk from China here, then order some delicious colors to create your prettiest spring cocktail dresses, skirts, and blouses. Habotai can also be used as a lining for all types of weather gear, such as cozy wool pants, fuzzy jackets, and coats. Although often known for fabric embroidery as used in traditional Korean Hanbok or Joseonot styles, Korean mills are trending the production of lightweight polyester and cotton blends to compete on the world stage. Mood has a particularly cool metallic version of said fabric mixed with white and silver yarns reminiscent of that special quality seen in traditional Korean embroideries and jacquards. Use this serene silvery fabric to steal the scene in a crisp blouse or formal occasion shirting. Other light polyester and cotton blends reminiscent of this outstanding fabric can be found here. 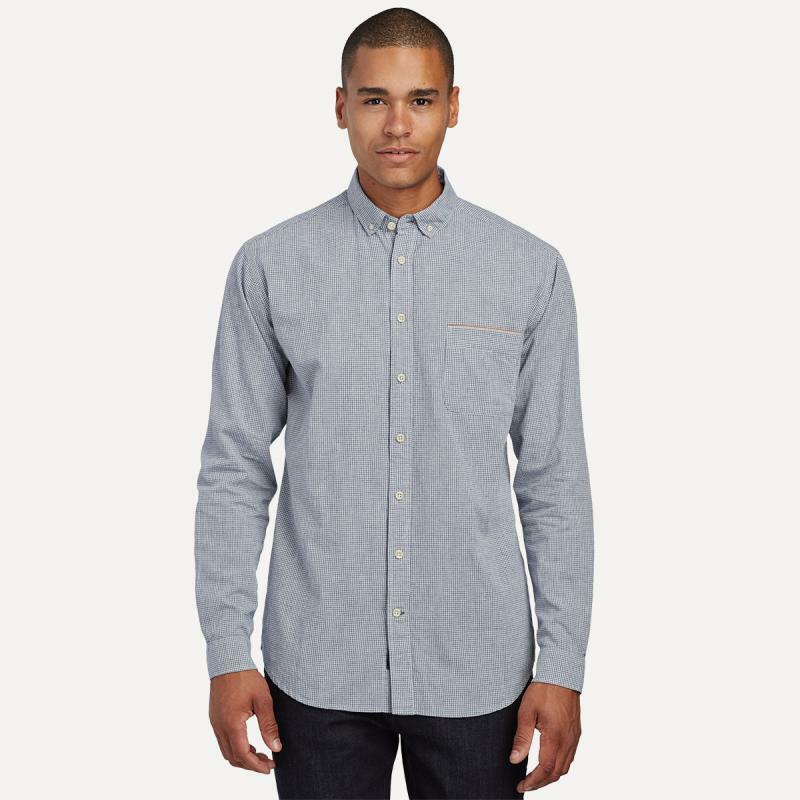 Mood Fabrics Has a Large Selection of Japanese Denim, Shirting, Twill, Pima Cotton and Wool. Use our novelty and fine Japanese denims, cottons, and wools to create crisp button-down shirts and soft jeans for a sweet everyday wardrobe. What makes Japanese denim the best of the best, anyway? In Japan, denim is often made on older looms which produce variations in the weave. These subtle variations make the denim interesting, strong, and rough to the touch giving it a better quality in the eyes of many enthusiasts. In addition, the dyeing of Japanese denim is a unique process which creates beautiful hues intensely sought after by fashionistas and fashion designers alike. Some even say, Japanese denim has the most character and is of the best quality because of these unique variations in weave and color only achieved by the inimitable Japanese weaving and dyeing processes. Finally, most Japanese denims are heavyweight which is particularly appealing to those looking for extra warmth on a brisk day of walking or whatever outdoorsy activity you enjoy. For more details on what makes Japanese denim great, check out an excellent article, “What makes Japanese Denim so Special?“, here from Heddles. Japanese wool has had a big resurgence as of late marked by ongoing collaborations, such as “The Wool Lab and Cool Wool” between Woolmark and Japan Creation. Japan also has a rich tradition of using wool for garments that dates back to the late 19th and early 20th Centuries. Here at Mood Fabrics we stock Japanese wool in cutting edge suiting fabrics that are sharp and on point. Japanese Cotton Twill, Shirtings, and Japanese Pima Cotton round out our offerings here at Mood Fabrics. Similar to the fine quality of our Japanese denims and wool, these Japanese cotton fabrics are of the highest quality and softest feel. Choose one for your next garment and make those workday doldrums fade away into a sea of beautiful browns, whites, greys and pinks with perky patterns of checks and stripes for whatever everyday style your heart desires. India is often know for its embroidered and beaded laces, brocades and jacquards. Mood Fabrics has some outstanding choices of intricately embellished beaded lace and satin jacquard material to assist you if you are planning a fabulous spring wedding and looking for a handmade beauty for that stunning wedding gown or bridesmaid’s dress. Many states in India develop their own fabrics with weaving, textile production and design considered a traditional family business. An example of the superiority of Indian jacquards for instance is the famous Kanchipuram sari. This state is known for producing wedding dress saris that are the most desired throughout India due to the traditional use of six twist threads as opposed to three twist threads in the weaves. Jacquard looms abound throughout India in semi-automatic, automatic, and even in handlooms which can produce some of the most sought after jacquard patterns in beautiful silk and satin. Take a look at what Mood Fabrics has to offer from this style of one of India’s most unique and popular fabric. To learn more about these traditions tour around all the hotspots in India yourself with advice from this Travel and Leisure article, or just purchase what we offer here at Mood Fabrics. Most of Mood Fabrics’ beaded lace offerings also travel a similar trajectory across this fantastical country of intricate fabric weaving traditions. So channel Marchesa or your inner Naeem Kahn, the native Indian fashion designer, and use beaded lace combined with satin jacquard to create a beautifully glamorous gown for your own private red carpet moment. Mood Has a Bevy of Italy’s Finest Knits, Cotton, Linen, and Wool Fabrics. From the multifaceted country of Italy, fabrics made of cotton, linen, silk, and wool predominant the textile manufacture industry. The creation of special knits and crochets especially is a mainstay. Additionally, mills in Italy are on the cutting edge of knit fabric innovation by investing in new technology to create knit fabrics which mimic the feel and design of a woven. These fabrics are called knit-weaves and can be made with patterns inlayed right into the knit. Italy has been known for its production of linen and cotton for centuries. Bergamo and Tuscany are two of the most famous cities where high quality cotton, linen, silk, and wool fabrics were manufactured and exported all around the world since the 19th Century. We all know that legendary fashion houses such as Missoni and Gucci can work wonders with gorgeous knitted fabrics. But with help from Mood, you can create your own treasured luxuries for transitioning to warmer spring weather. Check out some of our cozy Italian fabric styles below before you go on your next nature hike. Mood offers wardrobe staples for the Spring that are Made in the USA. We offer light and sheer fabrics such as organza and tulle that can be worn by brides at the perfect Spring wedding. Mood Fabrics also carries Supima cotton thermal and jersey knit and American made cotton fleece that can be used to create your basic white All-American Tees, sweatshirts with a pop of color, and snug pajamas. All of which are a must for chilly nights or relaxing on brisk Spring days. Supima cotton is superior pima cotton formed from extra-long staple cotton fibers 100% grown only in the U.S. Extra long staple fibers that make up Supima cotton give the fabric an extra softness compared to other cottons. In addition, the extra inch or three eighths of an inch that make up the fiber lengthwise gives Supima cotton superior strength and an incomparable fine quality. Our cotton fleece is super soft and comes from the inimitable American designer Ralph Lauren. After a night of relaxing, create a beautiful gown wear out for a night on the town. For the ultimate in glamorous dressing, create voluminous gowns using organza made by the king of glamour, designer Oscar de la Renta, or American Beauty nylon tulle, which is also American made. Check out the examples below. Mood has Home Décor Fabrics from Turkey in Polyester Brocade, Damask, and Raised Vinyl. Our selection of home decor fabrics from Turkey continue the Turkish Tradition of expert weaving luscious materials such as silk and velvet into brocades and other highly textured textiles called Catmas, Kemha, Canfez, Burumcuk. Catmas is a double-piled velvet fabric made with textured designs in the pile woven onto a background with plain weave. This fabric was most famously woven in the town of Bursa. Kemha are heavy silk brocade fabrics mostly made with metal threads woven in between the silk of the weft. Canfez is silk muslin gauze with a patterned weave and Burumcuk is a fine-spun raw silk gauze. Although some of the fabrics such as Kemha were used for the robes of royal Sultans, they were more often used for home furnishings such as rugs, pillows and draperies. Update your new pad with a modern take on this luxurious Turkish tradition with all of our home decor selections here at Mood. For more of a history on Turkish fabrics and designer fabric motifs check out some cool websites from ExploreTurkey.com and the Turkish Cultural Foundation. International Fabrics Give Any Sewing Project You’re Working On that Special Something. So although now you know where the best of each textile comes from around the world, there is no need to book a flight just yet. Head over to Mood Fabrics and pick up some of our international fabrics for your next sewing project. We have the best quality from China, Korea, Japan, India, Italy, Turkey, the USA, and many more. If your hoping to give your wardrobe or next home decor project an international flair, we’ve got you covered. And when your friends stop to ask, “Where did you get that beautiful piece?” Just tell them with a wink and a smile, “I made it from fabric that’s made around the world, and I got it from Mood“. What are the Best and Worse Fabrics to Use When Making a Patchwork Quilt Project? I finally had a moment to read what you wrote and wow you did a great job. You kept my interest and told me somethings I didn’t know. Having been in the fashion industry for 36 years you think you know it all but yet I find myself learning new things everyday. Be it googling, you tube, or your contribution to MOODS blog. You are on the road to being a great knowledge fashion designer. Best of luck don’t give up your dream! From one MOM to another we tend to do things for our family first and for us second. Study hard, get a good job in fashion and do what every to get to designer static. I predict Dana Bingham will be DBNY in no time. Keep in touch my e-mail is 1960strawberryblonde@gmail.com. Note there will be more space for you at the table the next time you intern at MOOD do stay in touch.